Small - $80.99 Medium - $80.99 Only 2 left! Large - $80.99 X-Large - $80.99 Only 2 left! Being the most elegant at a costume party isn’t enough for you and neither is being the eeriest. You want to go out this Halloween with the perfect balance of creepy and classy, don’t you? Well then, there is no need to look any further because we’ve got the costume for you! 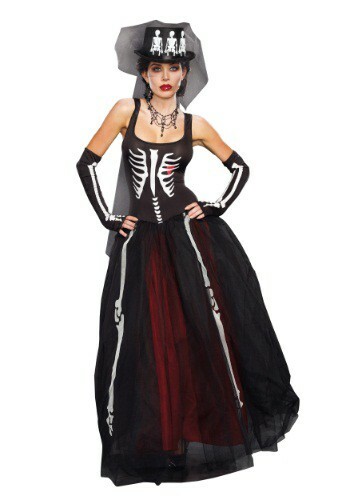 Check out this Women’s Ms. Bones Costume. Enter the party scene this year as the most sophisticated spook anyone has ever met. You’ll be as beautiful as you are mysterious with this alluring outfit on. The bones printed on the bodice, petticoat, and fingerless elbow-length gloves stand out like stars in the night sky. There is even a blood red heart printed behind the ribcage! Yikes, talk about haunting. To make this attire even more bone-chilling, add a few accessories. Grab a fancy top hat to wear atop your head, get your hands on some ghoulish jewelry to place around your neck, and complete this terrifying transformation with a daunting skeletal makeover. You’ll be the ultimate gothic diva and others won’t know whether to ask you to dance or to keep a safe distance away from you. So if you’re ready to be known as the scariest mistress in all the land, grab this dress and glove combo! Before you know it, word will spread about the eerie and ever so elegant Ms. Bones. You’ll be on party lists all around town, and people will be dying to have an appearance from you at their next big bash!